I snapped a few photos and put them on Facebook, asking my pals to identify the thing. Word got around, and by the end of the day, someone figured it out– it’s a Sexton beetle, also called the burying beetle, or “undertaker” beetle. Being so curious. 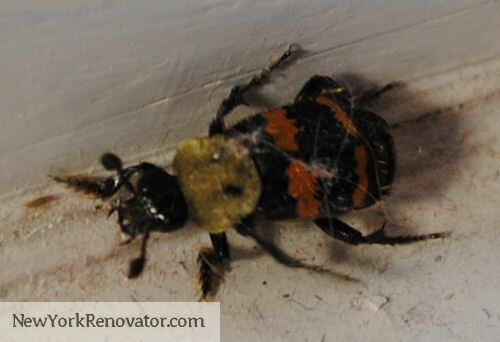 I did a little digging of my own, to learn more about the bug– especially to see if he was a noxious flesh-eating creature that would stalk my jugular while I slept… the name “burying” beetle got under my skin, I guess. The Sexton, or burying, beetle eats… dead things. They are carrion beetles. Is your skin crawling, too? :ik: Their favorite snack is a dead rodent or bird. The beetle will dig a hole under the dead critter, essentially burying it. It will then strip the carcass of the feathers or fur, and mama beetle will lay her eggs in the carcass. There, the larvae will feed on the carcass meat!! YUKKKKKKKKKKKKKKKK! This bug was TWO FEET AWAY from my tender skin! Yahhhhhhhhh!!! The endangered American Burying Beetle [Sexton beetle], Nicrophorus americanus, formerly occurred over the eastern half of the United States but is now found in only six states. Southcentral Nebraska has one of the largest populations remaining in the country. ….The American burying beetle is now found in only six states: Nebraska, Rhode Island, Oklahoma, South Dakota, Kansas, and Arkansas. There are now ongoing attempts to reintroduce it into Ohio and Massachesetts [sic]. Well, some say just two states, other guys say just six states…. you know what, they are wrong on all counts! This little bugger is crawling around my house in Upstate New York!!! Well,… he was crawling around. I …. ummm…. well, I kinda…. I squished him. That was before I knew he was endangered!! So save the SWAT team for another day. ← Brad Stine and Me: Separated at Birth? I’d be more worried that he’s hanging around your house because he likes dead things. Anybody missing? Checked the cellar lately? Eeeew! Well, I’m glad you finally figured out what kind of creature that was… if nobody had come forward with a possibility, I might have said it was the missing link between bees and beetles! LOL X) Alas, the warmer weather brings weird bugs… yesterday, we had a jumping spider IN OUR HOUSE; may not sound like much, but it looked like the poisonous, black widow spider except that it had a whitish-yellow dot on its back instead of a red one. Eeek! Anyhow, glad you got rid of that critter! Ewwww. It’s a good thing that you found him before he found you!! Did you end up emailing the photo to NY Dept Conservation? Glad you identified it! Will be traveling to Block Island this summer so will be on the lookout for your critter! I am not sure that you have the right species. I see that you have a burying/sexton beetle but there are almost 70 species. The endangered American carrion beetle has a distinctive orange pronotum that your beetle does not have as well as orange tipped antennae. Send your pics to those guys. They will ID them for you.